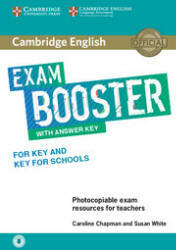 Cambridge English Exam Booster for Key with answers. Essential exam task practice for class or home study for use alongside a coursebook or intensively before the exam. Focus on essential exam practice with the Exam Booster for Key and Key for Schools. Maximise learners' potential with dedicated exam task practice for class or home study. 48 exam tasks practise each part of the exam three times while Exam facts provide practical information about each task. Exam tips provide useful advice on how to approach the exercises and 'Get it right' boxes highlight typical candidate errors in the exam. 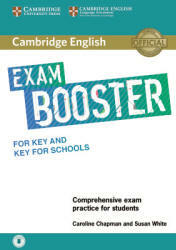 This Exam Booster is suitable for both Cambridge English: Key and Cambridge English: Key for Schools. Format: pdf (2017, 120p.) Without Answers. Format: pdf (2017, 144p.) With Answer Key. What is the Exam Booster? The Exam Booster provides focused exam practice of all parts of the Cambridge English: Key and Cambridge English: Key for Schools exam. Prepare your students for the exam, ensuring they gain the confidence, skills and knowledge they need for exam day. The Exam Booster contains 16 sections which follow the order of the exam: Reading and Writing Parts 1-9, Listening Parts 1-5 and finally Speaking Parts 1 and 2.